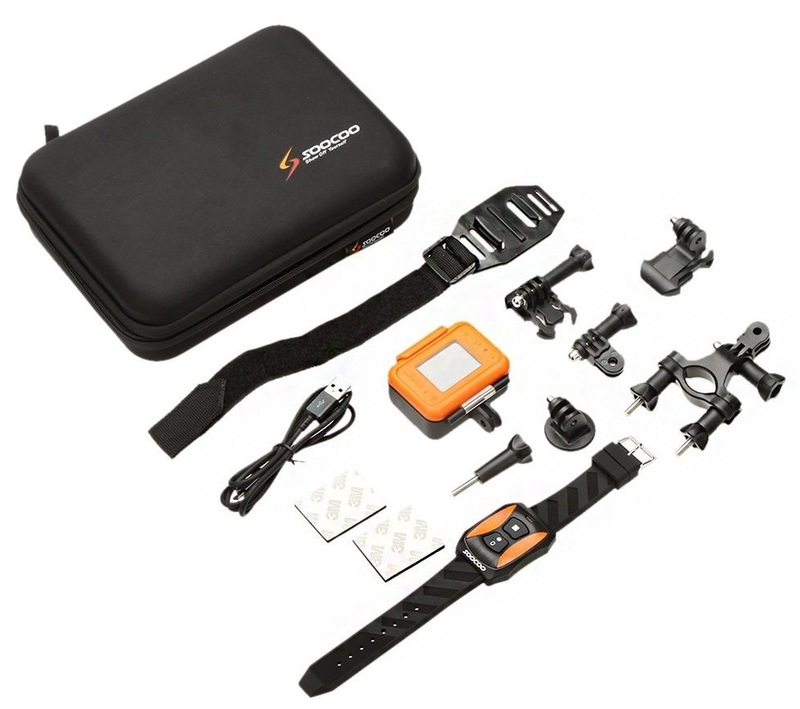 This review is for the SooCoo Model S60 (orange and black) action cam. Sent to me for review, this native waterproof action cam has been a real revelation. Unlike similar types of action cameras, this SooCoo model does not have a waterproof shell, it is organically waterproofed by virtue of its design. The only thing to watch for is that the cap that seals the USB port should be well tightened, otherwise water ingress is possible. 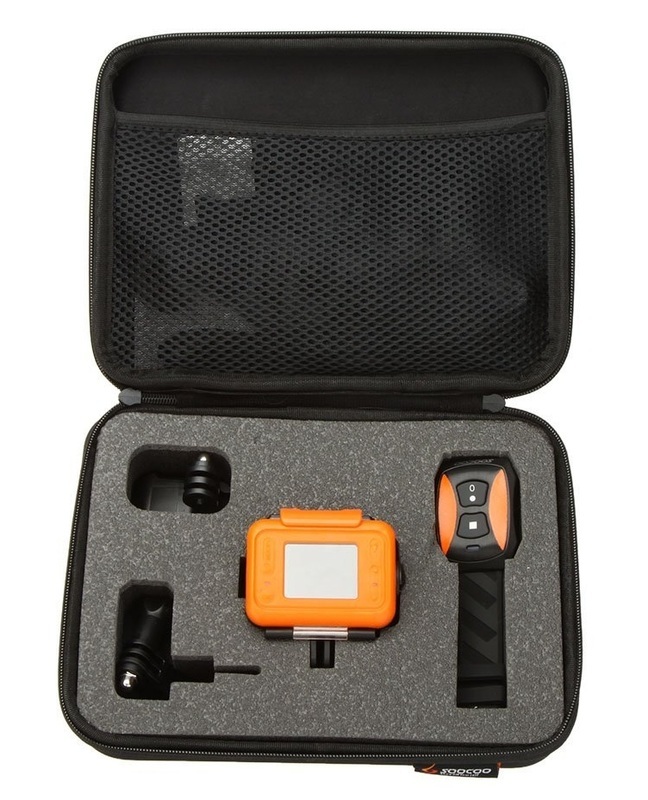 My husband has taken some fun underwater video, swimming alongside me the length of the pool, and the trick is to aim the lens correctly because with the sun it is very difficult to see what you are taking, but this is a common issue with these action cams. You basically aim roughly in the desired direction and go for it. The SooCoo is a lot of fun and is very easy to operate. Some more random observations. Travel Case - a really nice touch. With competing products, you have to buy it separately. You can store your camera safely together with its accessories, so it's ready for action and well protected from dust, bumps and accidental loss of bits and pieces. The cut-out compartments hold the different pieces safety embedded in soft foam and the rest can go in the net pouch above. Accessories – a good basic selection of mounting accessories. Without going overboard with dozens of pieces that I would never use, there is an attachment for the handlebars of a bike, which could also work over a pole; a basic flat holder which I find perfect for hand holding; a helmet strap in addition to 3M foam stickers; and some other articulated bits to customize attachment. Remote Control Bracelet - an extra that really impressed me. From it you can switch between Movie and Photo modes and also start, pause and stop filming without nudging the camera and spoiling its aim when pressing on the buttons is not so easy. Wall Outlet Converter - the USB charging cable has an optional mains converter. I like charging devices off the wall when a proprietary plug is provided. Sometimes USB ports are in short supply, or difficult to reach. Operation – very user-friendly. As usual with these compact action cams, the buttons are few and multi-functional. I like the option to zoom in and out and the four light settings. Specs – top resolution of 1080P with lower quality choices and various formats for photos up to 12MP. Manual – it's OK. As with every new gadget and toy, I need to read the manual twice and then try things before I get the hang of it. Screen – it's small but perfectly functional and you can use it to frame a shot and check what the camera is taking. It also gives important indications of what is going on, battery levels, date, time elapsed, etc. I was impressed by the clarity of the images when playing back what I had just filmed. Wide-angle Mode – spectacular, lets you capture all the action. Memory storage – can take up to 32GB. Memory card not included, so buy a good quality one and you won't regret it. Connections – transferring data to a pc or laptop could not be easier (we tested it with Win 8.1 and Vista). The SooCoo appears as an outside disk and behaves like one. Picture quality – really very good. I thought our underwater footage was outstanding. Due to Amazon's video size limitations, the quality you see on my video is not nearly as good as the footage I got. 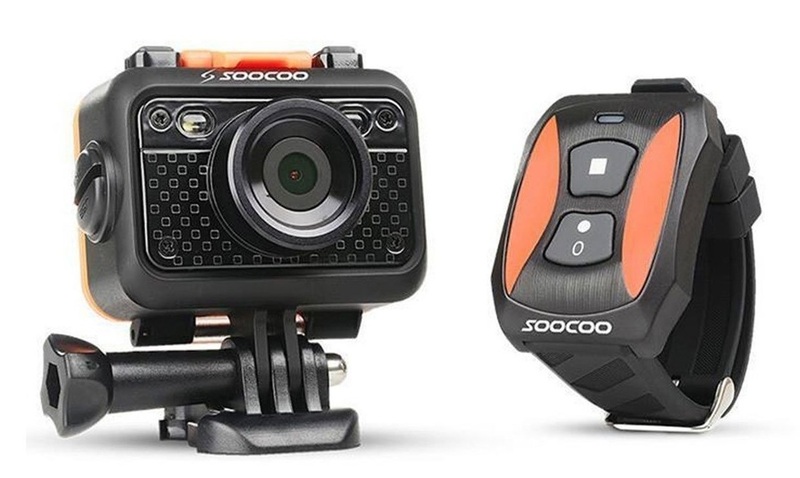 The SooCoo compares very well with similar action cams, but stands out for its unique features of not having a removable shell (which can interfere with sound quality recording) and the remote control band. It also has Wi-Fi capabilities, but I did not have the equipment to test that. It is possible to just use it with its default settings and get very good footage and still images, but a little time spent studying the manual and playing around with the settings will show you that this camera has a vast range of options. It also employs some innovative picture handling technology the details of which go over my head, but the results speak for themselves. A fun, responsive little cam for everyday use.